Her Majesty’s Canadian Ship (HMCS) Toronto recently seized 154 bags of heroin in the Arabian Sea, weighing more than 180 kilograms whilst operating under the command of the Pakistan led Combined Task Force (CTF) 150, one of three maritime task forces that make up Combined Maritime Forces (CMF). 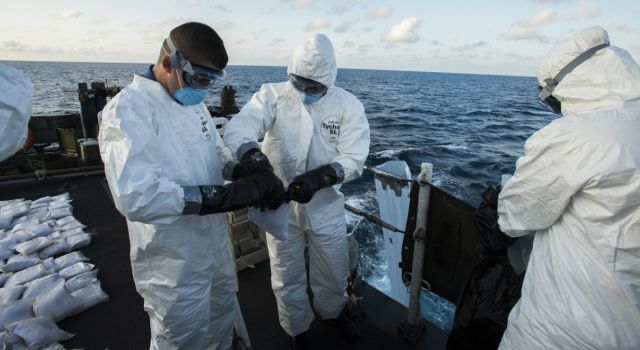 HMCS Toronto intercepted and boarded a suspected smuggling vessel approximately 500 nautical miles east of the Horn of Africa, and discovered the bags of heroin. The illicit narcotics were then catalogued and later destroyed, thus ensuring they would not reach their intended recipients. HMCS Toronto’s helicopter intercepts suspicious vessel. CMF is a multinational naval partnership of 29 nations, which exists to promote security, stability and prosperity across approximately 2.5 million square miles of international waters, which encompass some of the world’s most important shipping lanes. CTF 150’s mandate is about promoting the conditions for security and stability in the maritime environment. 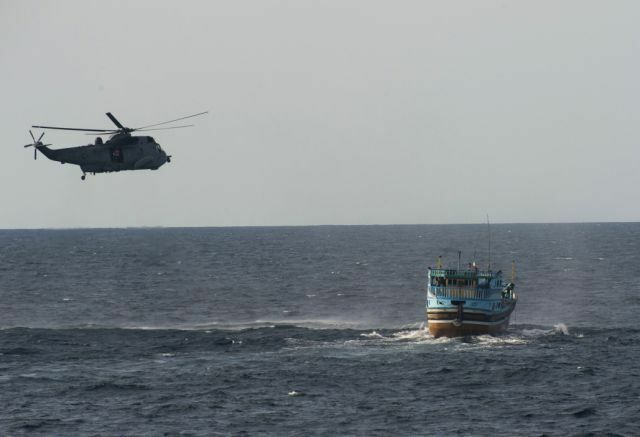 Maritime Security Operations deny international terrorists the use of the seas as a venue for attack or to transport personnel, weapons, or other illicit material. Narcotics gathered together for cataloguing before disposure. This drug seizure is HMCS Toronto’s seventh narcotics shipment disruption this year, totalling approximately 7.8 metric tonnes of narcotics, whilst operating under CTF 150. 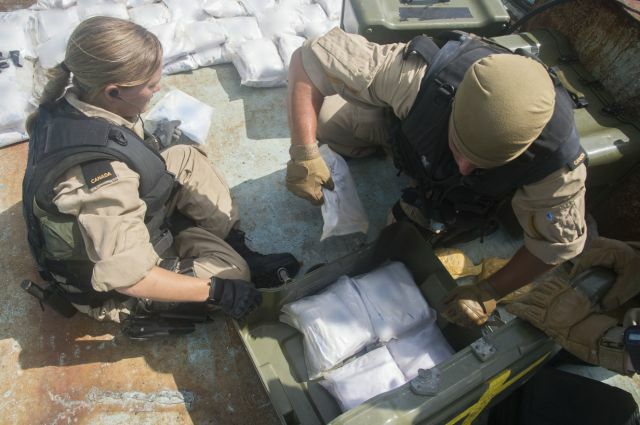 Members of HMCS Toronto’s boarding team gather together the illegal narcotics.